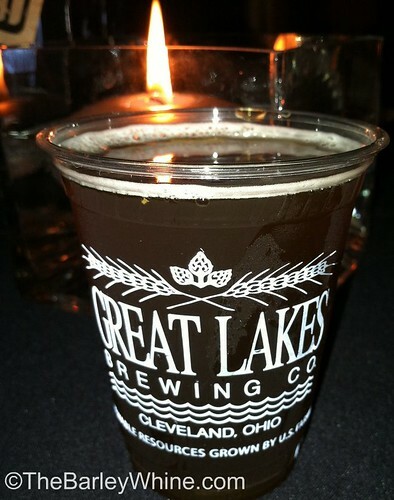 Great Lakes Brewing Company – The Barley Whine (“A Winter Porter made with Belgian Chocolate and Raspberries”) as we could handle. Following the pre-party we queued up outside the tasting room to get down to the business of tasting some bourbon barrel aged beers. Alberta Clipper: From the makers of the legendary Edmund Fitzgerald, another porter invites comparisons. The Clipper is much sweeter, with less hops and a lot more sweetness. The chocolate is slightly more pronounced, and the raspberry creeps in subtly in the finish. Each element is a well behaved, captivatingly conversant party guest. 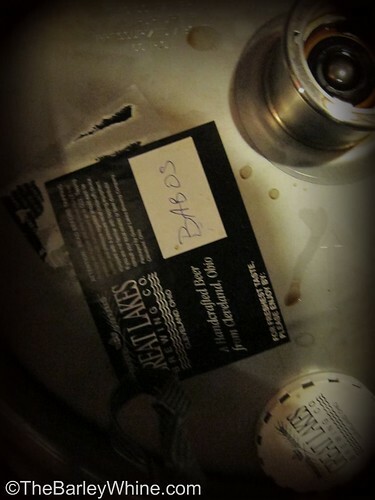 Barrel-Aged Blackout Stout 2010: Black with almost no head from the barrel and keg aging. The base beer is a Russian imperial stout with a good combination of sweetness and hops, a bit thinner in body than most, and more chocolate than dark fruit. With the time in bourbon casks this beast takes on new dimensions of vanilla, wood tannin, and that whiskey element that pairs so perfectly with roasted malts. A bit flat, and lacking much finish this may have aged a bit too long. Barrel-Aged Blackout Stout 2012: Bourbon everything! Foamy tan head is much stronger and longer lasting than the 2010. More carbonation as well. The vanilla is more pronounced, as is the sweetness of the bourbon. Great roasted malts , cocoa nibs, with some astringency. Boozy but with a better, more complex finish than 2010. Super delicious! What a tasty event! Thankfully, the marketing team at Great Lakes didn’t lead on people with the communications blunders of 2010. There was a small kerfuffle as the beer cherubs may have miscommunicated to some which BA stout was 2012 and which as 2010. And there was only a little food, but the truth is that people at this event were paying for the opportunity to buy 4-packs of the GLBABOS at $28. With no waiting overnight in cold, rainy conditions for the hope that a brewer releases enough of a beer you desire: $30 for sampling and a roof was not a bad deal. All the more, the party as well organized, well paced, and overall a marvelous experience for a craft beer junkie. I would highly recommend this or any tasting event at Great Lakes Brewing Company. Amazing beer with good friends at a world class facility invites you to visit for any reason, big or small.